From St. George's Market to awesome fine dining at Ox, Belfast is making serious foodie strides. Geraldine Gittens tucks in. Having fallen in love with Belfast a few years ago, I never lack a reason to return. A small-scale city full of creative spirits - there's always something different around the corner. This time? I decided to take a look at Belfast’s food scene. I set off on a mission to probe its most creative restaurants, and find some of its most talented food producers. 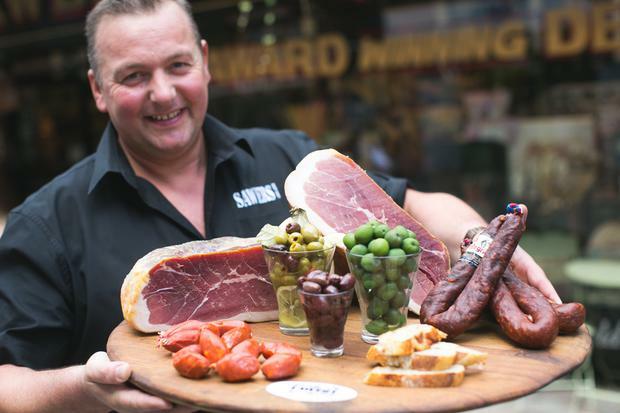 Where better to start than with the Belfast Food Tour? Led by the very entertaining Caroline Wilson, this walking tour takes you to Belfast's foodie hotspots, with lots of sides of stories and laughs along the way. Caroline is an encyclopedia of all that's edible, and she’ll have you transfixed as she introduces the tastes - and characters - on the trail. The meeting point is St George's Market on East Bridge Street. Here, stalls laden with Armagh apples, Comber potatoes, locally produced meats, gourmet sandwiches, freshly roasted coffees, curries, and falafel tantalise the appetites of the heaving crowd. On a Saturday morning, St George's Market is a mecca of slow food - and there's not much room for the hurried shopper; your best bet is to saunter and savour. 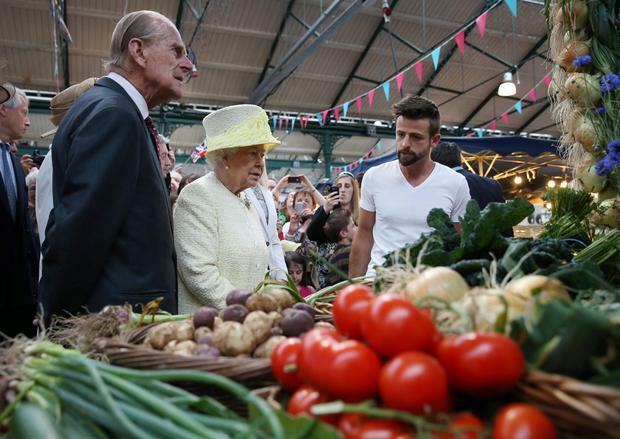 Queen Elizabeth II during a recent visit to the market. As soon as we walked in the door, crates of rosy Armagh apples and juices greeted us. Armagh, renowned as the ‘Orchard County’, grows 40m apples a year. (A trip to see the apple blossoms in May - or the harvest in October - is now definitely on the cards). We stopped for a coffee at SD Bell's Tea and coffee stall - staff had just finished roasting the coffee at 6.45am that day, and the proof was in the cup. Mr Cuban Sandwich was also a stall that popped out - and no surprise it did, for its owner has catered for the Game of Thrones cast and crew during filming, Caroline told us. We passed by Comber potatoes which have a 'Protected Geographical Indication' status – just like Armagh apples (and champagne and port). Caroline next brought us to The Garrick pub, which she says serves Belfast’s best champ. It also stocks a beer called Heather IPA - made from heather collected in the Mourne mountains. The iconic Sawers supermarket on College Street - a business established in 1897 - still to this day spills over with every imaginable food and deli item. It was here that we sampled Young Buck cheese, Ireland's only raw milk cheese which is popular with prominent chefs in the region. The John Hewitt pub was another stop-off - Mumford and Sons played here before breaking the charts. A little surprise near City Hall in the city centre is Co Couture on Chichester street. It’s a luxurious chocolate shop owned by trained chef Deirdre McCanny who travelled the world to find the world’s best cocoa beans before setting up her business. A trip to this little basement shop brings the experience of chocolate to life. It's so good that it’s hard to leave. Deirdre served up the most delectable hot chocolate with vegetarian marshmallows. And we brought home lots of handmade chocolates too. One other mecca overseen by pure craftsmen is Ox restaurant on Oxford Street. Ox is a pleasure that Dionysus himself would approve of - from the restaurant's light, warm ambiance to its attentive staff, it's a Laganside culinary awakening. My amuse bouche was a sumptious scallop, celeriac and ham hock. The venison was paired with melt-in-the-mouth squid (the best I’ve ever had), chorizo and romanesco. A dessert of praline, chocolate, brownie, malt ice-cream was the eighth wonder of the dessert world. This restaurant, for me, is better than any with a Michelin Star. The dishes are so creative that everything is a taste-filled surprise. Now, isn't that how dining should be? Meanwhile, we visited Coppi restaurant in Belfast’s buzzing Cathedral quarter on a Saturday night. The restaurant is exactly that - buzzing. It reminded me of a Jamie’s Italian - young and stylish, and full to the brim. The menu presents lots of choice - from risottos to pizzettes to meats - there’s something for everyone. It's a great spot for groups. So there you have it. Belfast is a wondrous cornucopia, and you've got to pay a visit. For more information on the foodie treasures listed above, see Belfast Food Tour (belfastfoodtour.blogspot.com), St. George's Market (belfastcity.gov.uk), Ox Belfast (oxbelfast.com), Sawers (facebook.com/sawers.belfast), Co Couture (cocouture.co.uk) and Coppi (coppi.co.uk). Book the best value packages in Ireland at travel.independent.ie.